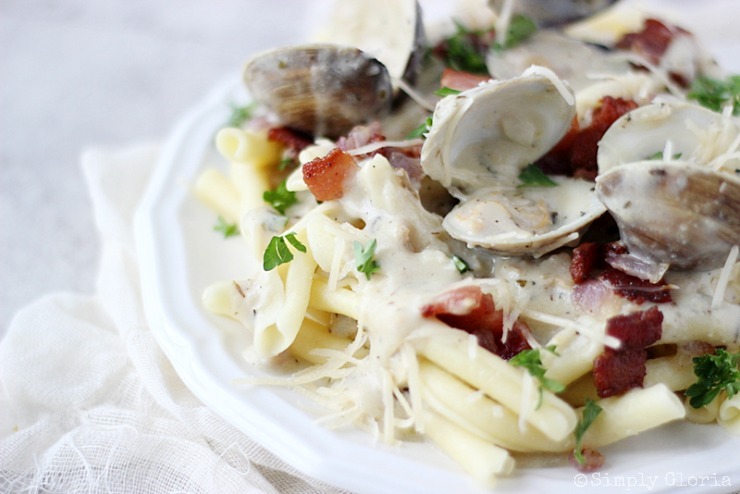 A rich, creamy clam sauce with crispy peppered bacon poured all over a bed of pasta. 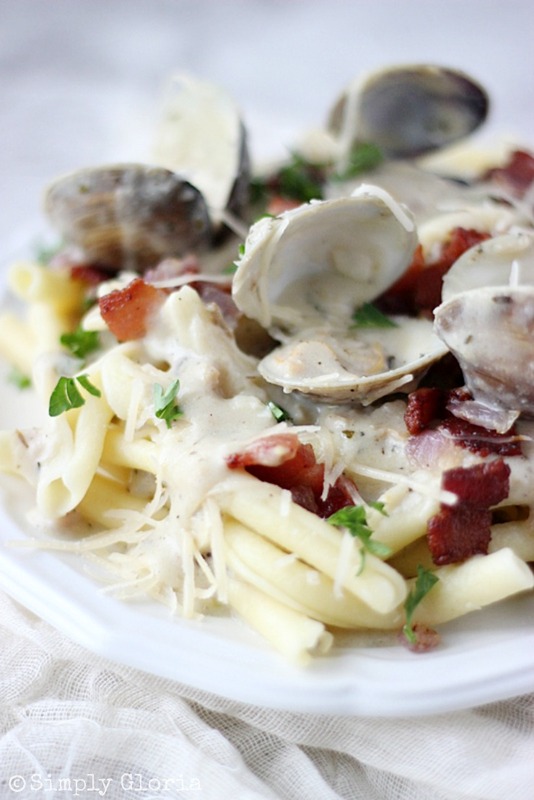 Fusilli Caserecci with Peppered Bacon Clam Sauce is so full of flavor and simple to make! Seafood and pasta has got to be one of my favorite kinds of foods to indulge in. With pasta, there is endless shapes and textures to choose from. So much possibilities! Fresh seafood, on the other hand, is a tad bit harder to come by here in Utah. Living in the middle of a state that is nowhere near the salty ocean… and living near a salty lake definitely does not count! But, finding a store that sells fresh seafood is a gem. Even if it’s clear around the mountain side. Because fresh clams are so hard to come by in these neck of woods (literally), I also use the good ole’ fashioned way and open up cans of clams. Those are always available and taste wonderfully! You may also use whatever pasta fits your fancy. 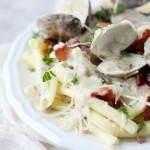 Fusilli Caserecci with Peppered Bacon Clam Sauce is a hearty dish to make any night of the week. This happens to be one of my go-to recipes when I’ve got extra bacon from the morning. If you’re wondering how in the world could there be leftover bacon? I have to hide it. Simple as that. And, if I fry it up ahead of time for this dish, I still hide the bacon. Or there would be no bacon for the dish! Have fun with this dish and make it for someone you love! 1 pound bacon, fried and cut into pieces. 1 1/2 pounds fresh clams, scrubbed and rinsed with cold water. Bring water to boil and cook pasta for 2 minutes less than what the package directs. In a large skillet, saute the onion and garlic in the 1/2 butter, until almost translucent on medium to low heat. Slowly whisk in the clam juice from cans, chicken broth, sherry, and then the cream. Turn up to medium heat. Continue to whisk until it starts to thicken. Once the clams have all opened, add the drained canned clams for extra clam action and crispy cooked bacon. Serve immediately over the drained pasta and top with fresh Parmesan and chopped parsley. This recipe serves 4-6 people. 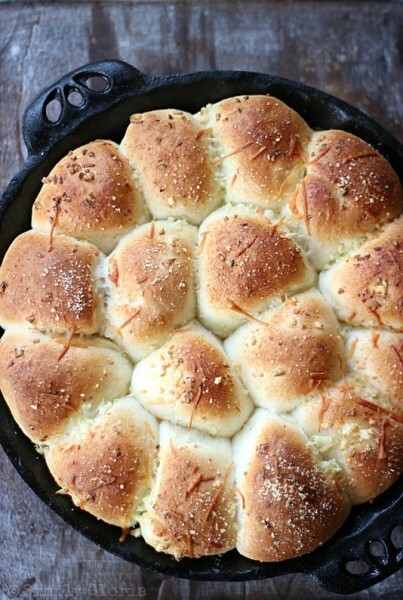 You may just love to try these Garlic Parmesan Dinner Rolls to dip in the creamy clam sauce! Yeah!!! Your back!!! Not that I was stalking your site or anything… ok.. I kinda was. 🙂 This recipe is awesome! I have never worked with clams before, they kinda freak me out but this recipe seems pretty fool proof. Love it and so fancy! Krista, I am going to bet once you make something with clams, you are going to think how simple it is and why you never did it sooner! So easy just setting them in some steam and waiting for them to open up and eat… easy peasy! AND, delicious! 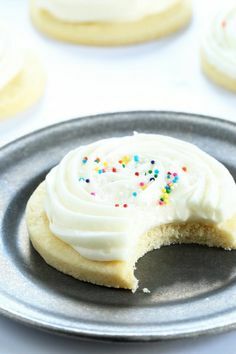 Yum, this looks so delicious! I am laughing out loud at the thought of hiding bacon. Funny, yes, but that is really smart! I love, love the new look Gloria!! And this pasta looks absolutely mouthwatering good!! I love that sauce; pinned 🙂 Hope you have a wonderful weekend! You are too kind, Chelsea! (I still have a few tweaks to make… like design my header.) Thank you! Yay, so glad you are back Gloria! Hope you had a wonderful summer! Love the sound of using your leftover bacon in this clam pasta 🙂 It looks amazing! This is making my mouth water! Mannn do I love seafood, especially in…well, everything. But the clam sauce sounds fantastic with pasta. And great job with these photos as they show the clams in all their glory. Nice to see you back again Gloria! Looks like you had a fantastic summer!!! Good for you… this recipe is awesome!! Deb@CookingOnTheFrontBurner recently posted…Amazing Apple Recipes! LOVE this pasta with clam sauce!! !